Cosmo has an arsenal of antics in her clown trunk. 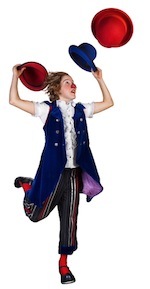 Circus surprises abound with flying hats, precipitous balancing acts, and inspired confusion. What will pop up next? Prepare yourselves for a generous helping of danger, dorkyness, and delight as she attempts valiantly to share the joys of circus with the audience, while skirting disaster. 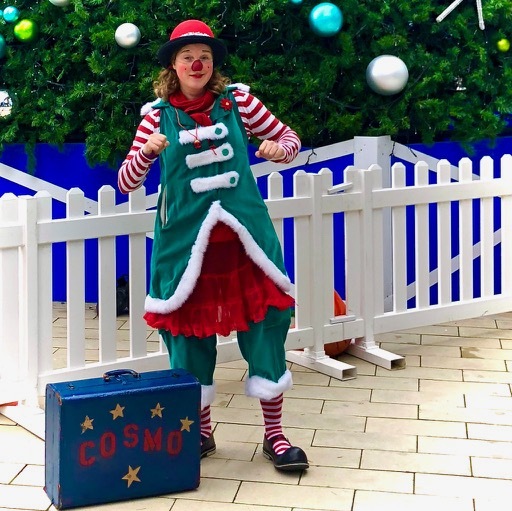 Witness the comedic stylings of Cosmo as she juggles, balances, and bumbles her way through this exciting show. 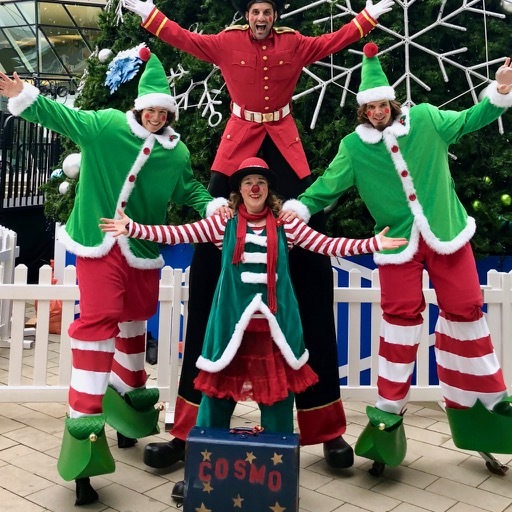 Easy set up and strike, combined with minimal sound and stage requirements make Cosmo’s Pop-Up Circus a versatile and engaging choice for your event. Suitable for family audiences and children ages 4 to 12. 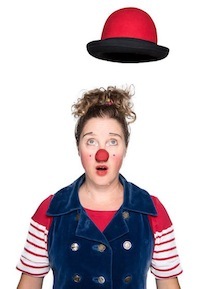 Melissa aka Cosmo the clown adventurer, brings 20 years of eclectic circus performance to the stage, circus ring, and hospitals. 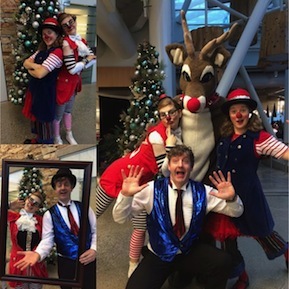 This quirky comedy stylist has performed in stadiums across the U.S., in a duck pond on Granville Island, at festivals throughout the continent, and currently, at BC Children’s Hospital and Canuck Place Children’s Hospice. She has also travelled with Ringling Brothers Barnum and Bailey Circus, riding the rails across the U.S. on a circus train. 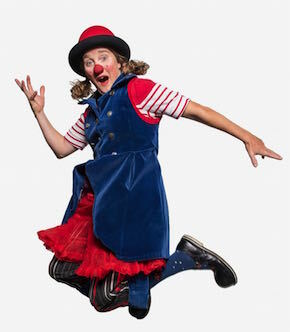 When Cosmo the Clown is performing, everyone is a potential playmate, and co-conspirator, whether she is roving through the crowds at a children’s festival, connecting one on one at BC Children’s Hospital, or whooping it up on stage, Melissa brings a blend of ridiculousness, warmth, and levity to all her interactions as a professional clown adventurer. Clown Surf – a comedy circus act featuring a bumbling surfer riding the waves. This is a skilled balancing act on a Rolla Bolla (stack of tubes and surfboards) It is the highlight of Cosmo’s Pop-Up Circus show and a crowd favourite. Crystal Balls – The crystal balls develop a life and mind of their own, Cosmo desperately attempts to keep them in line. The beautiful art of crystal ball manipulation, clown-style. Light up Ball Juggle – Cosmo shows off her juggling skills with beautiful glowing light up balls. Also presented in sun costume for a non-clown routine. Great for night time and low light atmospheres. "So awesome!… The audience’s faces were plastered with smiles." "Hysterical and enormously entertaining! Melissa is always the consummate professional." "You are just so magical at what you do!" -Debbie Tobin, Executive Producer, Richmond Children’s Art Festival.